Hello Chickens! Today I want to share some lovely news about a new project with you. But first, a teeny bit of backstory. I always thought I was going to be a lawyer. From the age of six or so, I would tell anyone who would listen that I was going to be a lawyer when I grew up. And anyone who ever heard me negotiate with my parents for a second glass of pop or one more chapter before bed had no doubt that was a smart path for me. In high school I served for a year on the Illinois Bar Association’s Young Lawyers Division after-school program. I was on my school’s mock trial team, and we took our show to the statewide competition where we went up against a school from Leaf River, IL, and I made one of their team members cry during cross examination. The Illinois Supreme Court Justice moderating the trial indicated I might want to skip college and law school and just start litigating. When I got to university, I was leaning towards a career in international law. Being that this area of law is all about treaties and trade agreements, and that China was going to open to the West the year after I was due to graduate from Law School, I signed up for Chinese 101, and started imagining my junior year abroad in the exotic Far East. Chinese 101 met five days a week at 9am. I went to one full week of classes, learning to say “Hello”, and then proceeded to sleep thru it not only the rest of the semester, but the entire last day to drop classes, garnering me my very first F in history, and plunking me solidly on Academic Warning. My parents were so proud. Since International Law was out, I shifted my focus to Entertainment Law, having been both a musician and actor, and imagined making millions protecting the interests of artists, and then retiring from practice young (with plenty of money) in order to serve as a judge. This was my goal for a full two years, right up until I spent the three months between my sophomore and junior year living in a mud hut in Kenya and teaching at the local secondary school. I realized there that I could be a good lawyer, and a wealthy lawyer, but not a happy lawyer. I returned stateside to pursue a career in education. One MA in Education and four years teaching high school English in the Chicago Public Schools, was followed by eleven years running education programs at not-for-profit professional theaters, and consulting with both education entities on arts integration in the classroom, and educational program development for arts organizations, as well as teacher and teaching artist training and curriculum development. Leaving the world of arts education for full time writing was the hardest decision I ever had to make, but also an important one. And making a life as an artist is a source of unimaginable joy. But I do miss the contact with young people, the connection of teaching, working with passionate educators. My once fervid desire to be a member of the legal community was replaced by a deep and abiding love of the legal procedural, in television, print, and on film. Name a Law and Order episode, and I’ve seen it. I own L&O Trial By Jury on DVD. If cops are fighting bad guys and lawyers are defending the innocent, it is on my TiVo, much to the chagrin of poor Charming Suitor who loves me in spite of it. Our schools, it is no surprise to any of us, are in a state of disaster. No Child Left Behind should have been called Every Child Left Behind, with essential areas of the arts and civics education lost to budget cuts and standardized testing. Teachers are desperate for interesting and compelling curriculum and resources, and kids are being given short shrift, especially in the area of Civics and education about our legal and judicial systems. 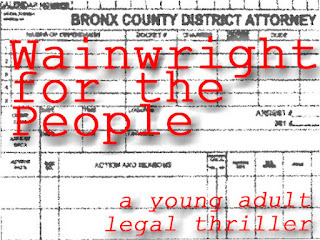 So when a friend of a cousin approached me nearly two years ago about potentially working with him to co-author a young adult legal thriller that would be a fantastic fun read for middle-schoolers, but also a source of actual information about the legal system and constitutional law that teachers could integrate into their classroom curriculum, I was intrigued. When he said we would not only write the book, which could hopefully be the first in a series, but that we would be developing student guides and teaching study guides, and creating a website to serve as a resource for educators, and that everything we did would be appropriate for use on both Constitution Day and Law Day in the schools, I was in. As a writer, working in a totally new genre is exhilarating. Since writing tends to be solitary and isolating, working with a wonderful collaborator is refreshing. And as an educator, working on something of genuine academic value is the work of my heart. 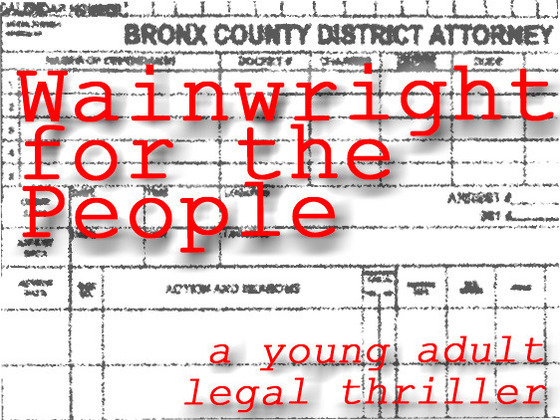 Wainwright for the People has been embraced by the American Bar Association, which will publish it in March of 2013. As I do with all my books, I would like to ask you to pre-order your copy. Unlike my other books, I am going to ask you to do it this month through Kickstarter. There is much work to be done, especially on the website development side and working on the educational materials, in addition to the actual writing of the book, and for all of that to happen, we need some support. Any donation of $15 gets you a copy of the book, same as if you pre-ordered from a bookstore or online bookseller, but in addition to the book, you will know you are helping make the educational elements of this project come to fruition. The campaign runs for exactly one month, so if you do want to pre-order your copy (or copies!) you have till the end of the month to do so. Feel free to post this on Facebook, tweet about it, send it in an e-mail to whomever you like. And thanks in advance for your support, it is an unbelievably exciting new venture and I am thrilled to be a part of it, and to share it with you all. Stacey - As a lawyer who is (usually) happy with her career choice, I say "Bravo." I donated to the cause. What a great project! Donation coming your way. I also work for a ginormous Chicago law firm, who coincidentally does book chat programs for a CPS magnet school and will be sharing the link! As a tax accountant who frequently deals with the legal side of tax bill and protests-- I had to back. I'm really proud to back this project and I hope it makes it into classrooms across America. I couldn't agree more about "No Child Left Behind" really being EVERY Child Left Behind. what? a series for young people that doesn't have a triangular love affair? no vamps or post-apocalyptic story lines, I can hardly wait to read this. On the local BOE that I was part of we deemed it No Child Gets Ahead.